Mumbai Dreams Events is a company catering for all functions from weddings to thanksgivings, birthday parties, corporate parties, Christmas parties, christenings, ceremonies and conferences. 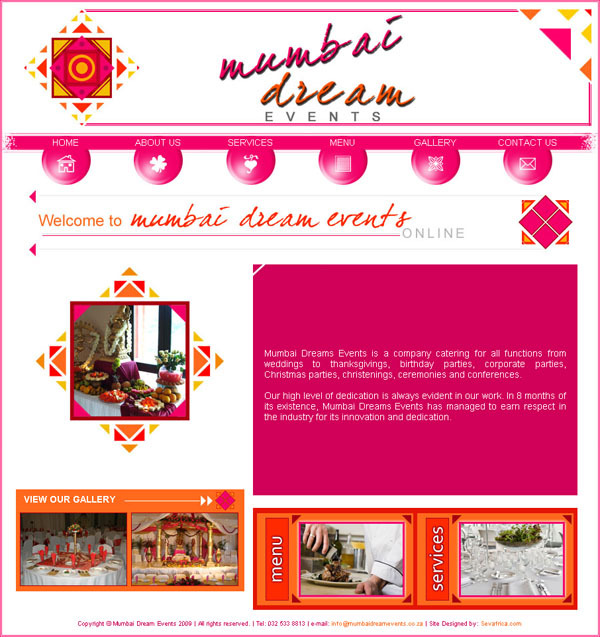 Mumbai Dreams Events started as the vision of one women who went on to establish her own catering business. With the seven years of experience gleaned from that business she went on to invest in her own property. She is now the proud owner of a 500 seated venue in the CBD of Verulam modestly known as Mumbai Dream Events. Her goal was to be able to create special events that will forever remain memorable to those involved and to provide employment for those less advantaged. XOOPS took 0.218 seconds to load. XOOPS Boot took 0.061 seconds to load. XOOPS output init took 0.062 seconds to load. Module display took 0.043 seconds to load.